© T. Credner and S. Kohle, AlltheSky.com. 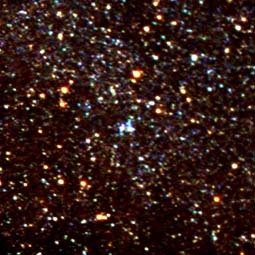 NGC 6709 is a loose open cluster (type III2m) in the constellation Aquila. NGC 6709 contains about 60 stars and has an estimated age of 315 million years.1 It lies about 5° southwest of the star Zeta Aquilae and about 6° northeast of the open cluster IC 4756. Three of its most prominent stars form the shape of a right-triangle. 1. Subramaniam, A. and Sagar, R. "Multicolor CCD photometry and stellar evolutionary analysis of NGC 1907, NGC 1912, NGC 2383, NGC 2384, and NGC 6709 using synthetic color-magnitude diagrams." The Astronomical Journal, 117, 937–961 (1999).